Hi guys! I just found out the other day that I have this Friday off for Good Friday! Hooray! I had to work a half day last year, so it was a pleasant surprise to get the whole day. Tonight I have the first half of the spring offering from Zoya which features 6 shimmer and creme polishes (technically one is called a topper, but I used it on its own). I just received the summer press release and it's another whopping 12 polish set, so hopefully I'll be able to show those to you soon. It hit 70 degrees here today, so it's sort of fitting to be showing these to you. Zoya describes Brani as a blush pink creme, but I found it to be more of a dusty rose color. I almost wanted to call it salmon, but I think salmon has more orange to it. It applied well in 2 coats, and dried shiny with no texture. I'll only mention it here, but removal was very simple for all of these since no glitter or larger flakes were present in the collection. As soon as I saw Darby, it reminded me of OPI's Check Out the Old Geysirs from the Iceland Collection. I really need to do a comparison check, so maybe I'll do that on Instagram soon. Zoya calls this a grey metallic, but it's definitely more of a dusty blue base with lighter blue shimmer. Like the OPI color, the shimmer hides a bit and is more evident in the bottle. Again, I used 2 coats for full opacity, and the formula was easy breezy. Haruko is a surprise hit from the collection! It's a very light lilac base with purple/blue shimmer. I could see the shimmer more than in Darby, and that makes me love it just a little more. The formula was a bit thinner than the rest of the collection, so you'll likely need 3 coats for full coverage. I also suggest doing an extra dab on the edge of the bottle before applying to the nail since the formula was thin and wanted to pool a bit on the nail. So far I'd say this is a really nice mix of spring shades. I'll be giving my final recommendations in the next post, so keep your eye out for that. 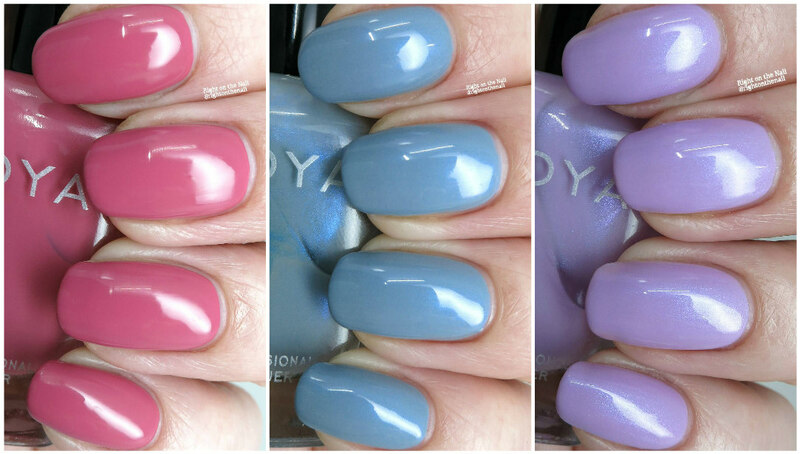 Zoya polishes retail for $10 and you can find out more about them on their website, Facebook, Twitter, or Instagram pages. Keep an eye out for them in your local Ulta store if you want to see the bottles in person before you buy.